The global interspinous spacers market is projected to reach US$ 100.96 Mn by 2026, expanding at a high CAGR during the forecast period. High adoption of minimally invasive surgeries, technological advancements, and acceptance & awareness of interspinous spacers are anticipated to boost market growth. Moreover, increase in geriatric population with spine surgeries is expected to drive the global market during the forecast period. According to research, lumbar spinal stenosis is a leading factor for the geriatric population opting for spine surgeries in the U.S. An article published in AMJ journal in May 2017 stated that over 200,000 adults in the U.S. are affected by lumbar spinal stenosis and the geriatric population is expected to increase to 64 million by 2025. Moreover, favorable reimbursement policies for interspinous spacers have enabled patients to opt for this treatment. The American Medical Association’s Current Procedural Terminology (AMA CPT Panel) Panel approved the addition of category I CPT codes for interspinous spacers. The new category I code replaced the existing category III CPT codes from January 1, 2017. The global interspinous spacers market has been segmented based on product, indication, end-user, and region. In terms of product, the global market has been bifurcated into static (non-compressible spacers) and dynamic (compressible spacers). The static segment held major market share in 2017. The segment is projected to expand at a faster CAGR during the forecast period, owing to low cost of these spacers which benefits patients in the developing countries. The dynamic segment is anticipated to expand at a high CAGR from 2018 to 2026 owing to low failure rates and therapeutic benefits in the spine disorder treatment. Based on indication, the global interspinous spacers market has been divided into lumbar spinal stenosis, degenerative disc disease, and others. The lumbar spinal stenosis segment held significant market share in 2017, attributed to high prevalence of the condition among the geriatric population and global rise in geriatric population, and rise in adoption of minimal invasive surgery. According to the United Nations, the global geriatric population is expected to triple by 2050 to reach 2.1 billion. In terms of end-user, the global interspinous spacers market has been categorized into hospitals, ambulatory surgery centers, and orthopedic clinics. The hospitals segment held major share of the market in 2017, followed by the orthopedic clinics segment. High market share of the hospitals segment is due to rise in the rate of hospitalization for spinal disorders, improvement in hospital care, and a range of services offered by hospitals at a single site. The orthopedic clinics segment is expected to expand at a high CAGR in the next few years owing to rise in awareness about spine disorders and their treatments. In terms of region, the global interspinous spacers market has been segmented into North America, Europe, Asia Pacific, Latin America, and Middle East & Africa. North America dominated the global market in 2017, owing to increase in demand for minimally invasive surgical procedures, new product launches, and high geriatric population with degenerative disc disorders and lumbar spinal stenosis. Moreover, leader players have an opportunity to invest in North America due to availability of only three products in the region. This, in turn, drives demand for interspinous spacers. According to research, the U.S. has 250,000 to 500,000 spinal stenosis patients. This is attributed to the country’s dominance of the market in North America. The U.S. is anticipated to sustain its leadership position during the forecast period due to large number of patients with lumbar spinal stenosis and degenerative disc disorders and favorable reimbursement for interspinous spacer devices. Additionally, increase in lumbar spinal stenosis in the geriatric population drives demand for interspinous spacers in the U.S. which is likely to augment the market in the region. Europe was the second largest market for interspinous spacers market in 2017, followed by Asia Pacific. 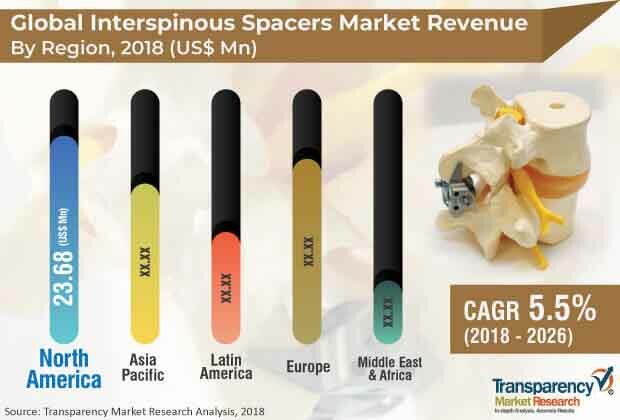 Favorable regulatory and reimbursement scenario, substantial approval of products, and presence of high geriatric population and people with spine disabilities are likely to propel the interspinous spacers market in the region. The market in Asia Pacific is projected to expand at a significantly high CAGR during the forecast period, owing to increase in the geriatric population in countries such as Japan and China, higher incidence rates of lumbar spinal stenosis & degenerative disc diseases, rise in per capita income, and improving health care infrastructure. Furthermore, increase in health care expenditure and investments by key players in emerging regions are expected to propel the market in the region. However, higher rate of reoperation risk after implantation of interspinous spacers is anticipated to restrain the market. Major players operating in the global interspinous spacers market include Medtronic, NuVasive, Inc., Paradigm Spine (RTI Surgical), Zimmer Biomet, Vertiflex, Inc., Life Spine, Inc., and Globus Medical, Inc. These players are focused on research & development of innovative solutions for spine surgeries, geographic expansion through collaboration and mergers, and new product launches to expand presence in the global market. This report analyzes the current and future scenario of the global interspinous spacers market for the period 2018 to 2026. Increase in the global geriatric population, rise in demand for minimal invasive surgeries, and surge in incidence of lumbar spinal stenosis are projected to drive the global market during the forecast period. Moreover, innovative product launches and their commercialization across the globe is anticipated to augment the interspinous spacers market. The report comprises an elaborate executive summary, including a snapshot that provides information on various segments of the global interspinous spacers market. It also provides information and data analysis of the global market with respect to segments based on product, indication, end-user, and region. A detailed qualitative analysis of drivers, restraints, and opportunities of the market has been provided in the overview section. Additionally, the section comprises a competitive matrix and profiles of key market players, along with business overview, to project the competitive landscape of the market. Based on treatment, the global interspinous spacers market has been bifurcated into static (non-compressible spacers) and dynamic (compressible spacers). In terms of indication, the global market has been classified into lumbar spinal stenosis, degenerative disc disease, and others. Based on end-user, the global interspinous spacers market has been divided into hospitals, ambulatory surgery centers, and orthopedic clinics. The market size and forecast for each of these segments have been provided for the period 2018 to 2026, along with their respective CAGRs for the forecast period 2016 to 2026, considering 2017 as the base year. In terms of region, the global interspinous spacers market has been segmented into five major regions: North America (the U.S. and Canada), Europe (the U.K., Germany, France, Spain, Italy, and Rest of Europe), Asia Pacific (India, China, Japan, Australia & New Zealand, and Rest of Asia Pacific), Latin America (Brazil, Mexico, and Rest of Latin America), and Middle East & Africa (South Africa, GCC Countries, and Rest of Middle East & Africa). The market size and forecast for each of these regions and the mentioned countries have been provided for the period 2018 to 2026, along with their respective CAGRs for the forecast period 2016 to 2026, considering 2017 as the base year. The research study also covers the competitive scenario in these regions. The report also profiles major players operating in the global interspinous spacers market based on various attributes such as company overview, financial overview, pipeline portfolio, product portfolio, business strategies, and recent developments. The players covered in the report include Medtronic, NuVasive, Inc., Paradigm Spine (RTI Surgical), Zimmer Biomet, Vertiflex, Inc., Life Spine, Inc., and Globus Medical, Inc.